X-Small - $33.99 Small - $33.99 Only 4 left! Large - $33.99 Only 8 left! Printed food stains on front w/ phrase "Chef Hugs-N-Quiches"
If there is anything that your little babe knows, it is what they wanna eat and what they’d prefer to chuck out of their mouths, onto the floors, and probably into your hair! At first, it makes a person think that they’re just being rude, but those little ones have a surprisingly complex sense of taste and their palate is highly attuned. Sine it isn’t easy trying to train your own personal 3 star chef, it's probably best to start your little cooking genius out early. You can teach your baby the importance of using the right amount of spice and how cook risotto like a champ. Of course, your tyke probably already has a pretty distinctive set of lungs, so, they’re already on the right track in taking after the most notorious and famous of TV personality and Master Chefs in the world---we’re looking at you, Mr. Ramsey! (Though, maybe encourage little more kindly a choice of vocabulary!) But, in no time, your tyke will be telling the difference between cooking styles and perhaps be the first to ever win that super complicated blind taste test contest that always gets people sent home early! 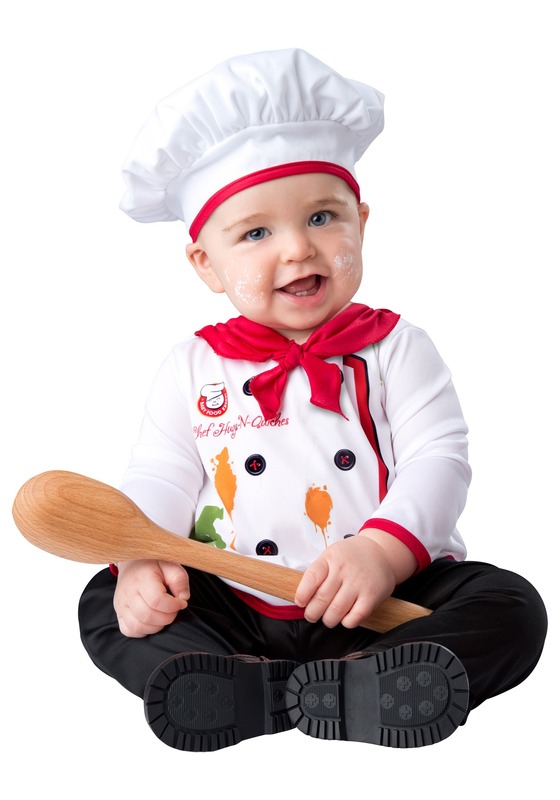 Your little one will need a new outfit to reflect that growing culinary prowess and that's where we come in! Inspired by famous chefs of the world, this Infant “Hugs and Quiches” Chef costume comes with everything you need to get your baby's Master Chef look just right. With a top that resembles a classic chef's coat, it's the easiest way to get your little one ready for the next masterpiece in the kitchen. And, hopefully this time, it won’t be splattered all over the floor!